Mach 24, 2019 Two desert maps have been added for MONTGISARD: The first one, named The Horn is intended to play with scenarios during the battle of Hattin. The other one, named The Oued, is intended for scenarios during the battle of Montgisard. 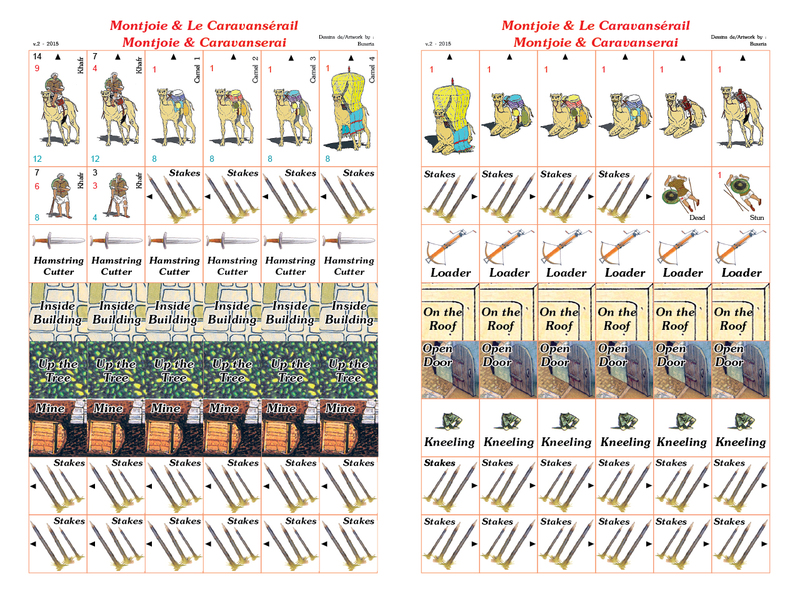 All the characters in good health are now completed for Montgisard. The work on the horses has now started. It should go much faster. January 7, 2019 The cover art for MONTGISARD is now completed. December 19, 2018 3 new series of Fatimid and Anatolian infantrymen for MONTGISARD. November 29, 2018 Our Holiday promotion is in place, with up to 20 Euros in shipping discount and 4 new, original scenarios for Ager Sanguinis included with any order by December 24, 2018. October 21, 2018 I started the countersheet for the Ayyubids, with a set of Mamluks and Ghilman. 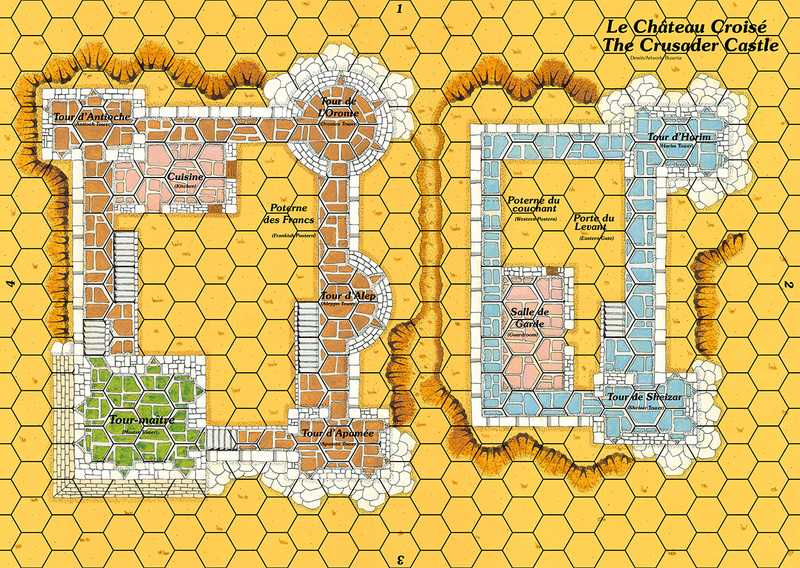 The map of the Crac des Chevaliers is finally completed! September 30 2018 Finally an update to this site! But I didn't stay idle for the last 4 months. I worked hard (even though inconsistantly) on the double map of the famous Crac des Chevaliers. It's been a daunting task and the digital cleansing of the maps has been taking way longer than anticipated. It is now almost over and I can share with you the (almost) final look of this impressive fortress. I still need to clean the northern and eastern external curtain walls, something that should be completed by the end of the week. I also added an overlay (I should say underlay actually) depicting the underground vaulted ramp that led to the inner yard of the Crac. Using a separate map for this has 2 benefits: It will be easier to manage counters being underground and those being in the yard above them; and it will be possible to play these maps with a slightly less formidable castle, with the main gate giving a direct access to the outer ward. The double map without its vaulted ramp can represent the castle of Kerak for instance. May 19, 2018 The creation of new counters for MONTGISARD is progressing at a slow pace, with several series of men-at-arms: King's guards, medium infantry, light infantry and crossbowmen. March 15, 2018 First draft of the double map of the famous Crac des Chevaliers which will be included in the MONTGISARD extension, even though this fortress belonged to the Hospitallers and the plan is based on the castle of the 13th Century instead, 100 years after the events depicted in MONTGISARD... I wanted to propose a replacement for the original Castle of the Templars map from Eurogames, and the Crac plan was more suitable and playable than the one of the castle of Kerak. 5 characters on foot were created. Click on the illustrations of the first 2 Templars, Baldwin, Raymond and Milon to see them. February 25, 2018 The counters of THE ANARCHY are now available on thicker cardboard and printed on 3 A4 sheets (like those of AGER SANGUINIS). We added 4 new counters: a light cavalryman, a crossbowman, a staff slinger and an engineer. A pack with all 3 sheets is now available in the Shoppe, as well as the individual components of THE ANARCHY like maps, overlays and rulebooks. 4 new illustrations of nobles were added for MONTGISARD: Baldwin The Leper King, Balian of Ibelin, Reynald de Chatillon and Raymond of Tripoli. January 1, 2018 Happy New Year and best gaming wishes for 2018! The free-shipping (or up to 20-Euro reduction) for anything in the Shoppe is extended until Wednesday January 3. Hurry up if you didn't take advanatge of it already! I added the various PDFS of the booklets and play sheets for AGER SANGUINIS. I created a picture with the first 6 drawings of knights Templars to simulate a charge and illustrate the MONTGISARD page. Dec 24, 2017 I started the creation of knight Templars for the upcoming MONTGISARD extension to AGER SANGUINIS. The 4th one is a modification from a (very nice) knight Hospitaler of the 13th Century. I added the mail skirt to the horse that can be seen in the movie Kingdom of Heaven. One week left to benefit from free shipping (or up to 20-Euro reduction) for anything in the Shoppe. November 19, 2017 The latest Norman Saga Vassal module is now available for download, with all the maps and counters of the games GUISCARD, DIEX AÏE and THE ANARCHY. October 15, 2017 The webpage for MONTGISARD, the future extension for AGER SANGUINIS featuring the Templar knights in the time of Baldwin IV, the Leper King is on line. September 29, 2017 AGER SANGUINIS is finally released after 2 years of hard work! All pre-orders have been shipped and our resellers now have the game in stock. July 24, 2017 You can now pre-order AGER SANGUINIS in the Shoppe at a discounted price (59 Euros vs the standard price of 64 Euros) until September 15. The game will be released at the end of September. July 4, 2017 I realized that this page had not been updated in a long time! Yet AGER SANGUINIS is moving forward: The 2 initial A3 countersheets became (4) A4 counter sheets as we will be using a new printing solution to get you thicker counters, something many people ask for. 16 tactical scenarios and 4 campaigns have been written and the beta-tests are being finalized. The play sheets are completed and we are currently going through the painful process of proofing the manuals to chase any typo or mistake that we may have left behind. The last step will be the cleansing of the tactical maps to be ready for printing but I'm confident everything will be ready by the end of the month. Of course the initial release date of Spring 2017 is now gobe by, but I can confirm that the game will be available in September, as the summer months are never a great period to introduce a new product in Europe. March 12, 2017 I completed the rulebook for the tactical game over the last month and started the translation of the historical background. I added a sheet of overlays representing various tents including a gorgeous bedouin tent for a seljuk dignitary, inspired from the tent of Saladin that can be seen in the movie "Kingdom of Heaven". I'm starting the work on the campaign game. The campaign map and counters are almost completed already. February 5, 2017 Both counter sheets for AGER SANGUINIS are finally completed. It's benn an incredible endeavor that lasted way too long: Glad this is over! I'm now starting to write the rulebook, using the latest GUISCARD rules as the template. January 9, 2017 All my best wishes for the New Year! The completion of the counters for AGER SANGUINIS is taking way longer than anticipated, but I made a lot of progress over the last week: All the foot characters of the main counter sheet are now completed and I expect to finish all the counters by the end of next month. The game release will likely be towards the end of the Spring rather than its beginning, but it is only a few months away now. I'm already brainstorming on the future releases and I will sahre my thoughts with you in the near future. November 22, 2016 Big update for the AGER SANGUINIS counter sheet: 37 new stunned characters were added, mostly Turks and Arabs. 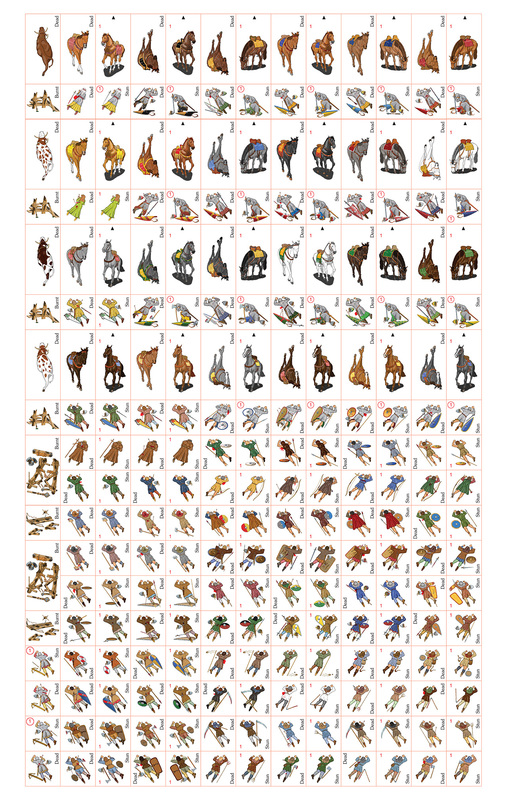 All the character Stun stances are now completed and I start the horses (and camels). I should be able to move fast this week, so stay tuned for more updates by the end of the week. October 12, 2016 The manuals of DIEX AÏE were upgraded to version 1.2 and can now be downloded from the site. October 10, 2016 DIEX AÏE is available again, and we updated the rulebook and scenarios to Version 1.2. The Meadow map is also in stock again. August 27, 2016 I started the Stun stances of the counters. Already more than 30 completed. The back of the countersheet was added for you to check the progress. August 9, 2016 The Plateau, the last map for AGER SANGUINIS is completed. It displays an open terrain with a stone field, typical of the barren lands of the Middle East. The map of the Fort of Mont-Briton is now out of print. You can still find it with our resellers, so you really want to get it, you should hurry! August 4, 2016 The Village of Outremer map is completed. It was much more difficult to design than other maps due to the 3D effect on the walls to match the style of the Caravanserai. You probably noticed that the design of AGER SANGUINIS takes much longer than the previous installment in the Norman Saga series: At the same time last year, the counter sheet, the 3 tactical maps and the historical background of THE ANARCHY were already completed. I still have 2 full months of work on the counter sheet of AGER SANGUINIS, a third map to design and the historical booklet is not even started. As I don't want to rush things and compromise on quality, it is safer to announce that the game release is postponed until Spring 2017, around the Easter timeframe. No new game to put under the Christmas tree this year then, sorry. This could actually be a great opportunity for those of you who didn't get THE ANARCHY yet to try it and even to play the Campaign game in the meantime! July 6, 2016 The first map, The Crusader Castle, is completed and I drafted the Village of Outremer map. June 1, 2016 All dismounted versions of the various riders for AGER SANGUINIS are completed and I added 3 new types of Frankish infantry. I expect to complete the last types of Turk and Syrian infantry by the end of the week. May 14, 2016 Introduction of the AGER SANGUINIS box artwork, by Massimo Predonzani, as the previous installments of the Norman Saga. The rules and Historical background/Scenarios booklets of GUISCARD, DIEX AÏE and THE ANARCHY can now be downloaded from each game page. DIEX AÏE is temporarily out of stock as we are out of the counter sheet, but the other components can still be purchased separately in our shop. Check with our resellers who still have the game in stock. March 23, 2016 New counters for AGER SANGUINIS were created over the last month, even though it's never at a fast-enough pace. I added Oriental Christians like Armenians and Maronites, Frankish crossbows, Turkish cavalrymen and camel riders. I also posted the first sketch of the Crusader Castle, inspired from the castles of Arima and Saône. February 22, 2016 5 new horse riders for AGER SANGUINIS: 5 turcopoles and 2 other ones that only people over 50 in Europe will recognize, if they happened to watch it on TV: This French series was broadcasted in the UK, I don't know about other countries. So many years later, it is now almost unwatchable but the soundtrack is still a masterpiece which puts you in the mood of the era! January 26, 2016 The Vassal modules for the campaign games of DIEX AÏE and THE ANARCHY are available. Fabulous work by col_klink who was able to automate the management of counters and settlements: Just right-clic to access all the parameters and edit them at will. I refreshed the picture of the aborted project of Krak des Chevaliers from Eurogames with a larger version with better quality and partially colorized by me a few years ago already. January 24, 2016 Presentation of AGER SANGUINIS, the fourth installment in the Norman Saga series, which will simulate the showdown between the principalty of Antioche and its Armenian allies and the Seljuk Turks in Northern Syria. 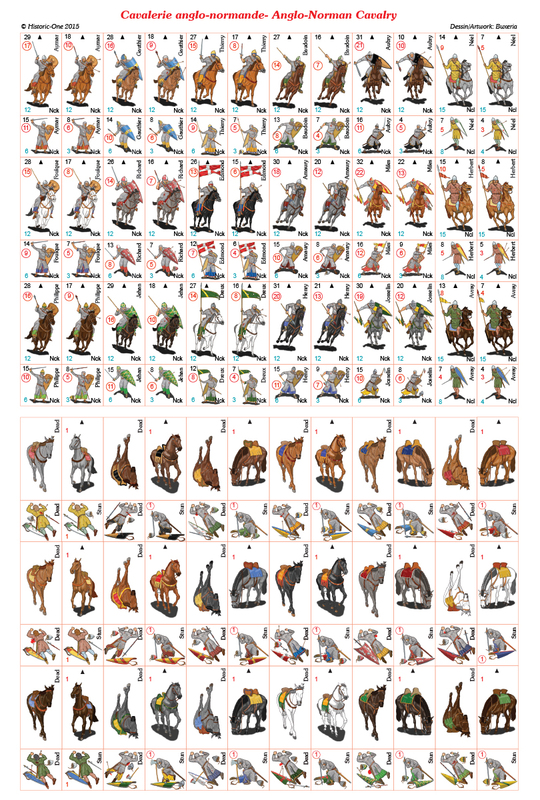 The first featured counters display knights Hospitaller, turcoples and several Seljuk cavalry and infantry men. Here is the first erratum for THE ANARCHY as several typos, mistakes or needs for clarification were found by the first players or Lutz Pietschker, the translators of the German version, who is very good at detecting them. December 17, 2015 We sold the last copy of the Crusader Harbor map pack and is now officially out of print. The other harbor set, replica of the Eurogames version that was never released is still available and selling well (we are already through our third print run)! Dec 9, 2015 The official release date for THE ANARCHY will be December 14th, as one counter sheet had a problem and the print shop had to redo it. The special pre-order price of €59 (vs €64 after) is extended until Sunday, December 13 for orders placed in our Shoppe. Note that we also propose a pack of 2 counter trays as an option to sort all the various counters. Feel free to order additional ones to retrofit your other games. No worries, I was just fully focused on the release of THE ANARCHY with no time to post the various new components or updates. The game is now almost completed and should go to print by the end of the week, which gives me time to work on this long overdue website update. Here are all the final markers, overlays, maps and counters for the campaign game, as well as all 8 play sheets to give you a feel about the new rules. The game should be released around December 10th unless we face an issue with the printing process. September 29, 2015 My friend col_klink who already authored the Cry Havoc 3 Vassal module just completed the new NORMAN SAGA Vassal module. It includes all the game components of GUISCARD and DIEX AÏE and is available as a free download. The above mentioned Vassal module exists in another version that includes all the game components of the upcoming THE ANARCHY game and will be used for extensive beta-testing of the rules and scenarios. If you are interested in joining this beta-test program, please contact us and we will send you the test package. Your feedback is expected by the end of october. August 15, 2015 The third (and last) tactical map for THE ANARCHY is posted: The Creek, which can be combined with the river maps (like The Woodbridge in DIEX AIE) and the coastal maps (like those in GUISCARD). The version 2 of The Hill map is now available in the Shoppe. Like the other updated maps, the hex grid was normalized, as well as the texts, the color of the ground and the style of the trees and brushes. July 23, 2015 The second map for THE ANARCHY is The Priory. Several of them were fortified during the Civil War and the multiple attached buildings will make for an interesting tactical map. July 1, 2015 Both rule booklets for GUISCARD and DIEX AÏE can now be downloaded as PDFs. Both of them are in version 1.1. for Diex Aïe, the modifications compared with the printed version 1.0 are those already mentioned in the erratum v4.0 (downloadable as well). June 28, 2015 The reverse of the counter sheet is now complete! Quite an undertaking, especially for the burnt siege engines. I expect to complete the wounded stances of the front sheet by the end of the week. May 31, 2015 New counters again, with 3 new character classes: The crossbows, the mounter sergeants and a brand new type of missile throwers : the staff sling, which was used during sieges to throw heavier stones or flammable materials over the walls. Beside that, the unrewarding task of creating more Wounded, Stun or Dead stances continues, with 57 new ones. May 10, 2015 The counter sheet for THE ANARCHY moves on, even though not as fast as I would like. Among the new views: A mangonel, a ballista and a mantlet, the wounded stances of the knights and their standalone horses, the horses for the ladies and Welsh cavalry and the stun stances of the peasants and slingers. April 5, 2015 23 new characters were added to THE ANARCHY counter roster: All Dead stances for the 15 knights, 2 mounted ladies who will spice up the scenarios, 2 builders who can be used either for the priory construction or for mining, and 4 oxen to drag the siege engines. Updated map of the 550+ fans of Cry Havoc in the World. March 29, 2015 Discover the box art of THE ANARCHY. It was designed by Massimo Predonani who created also the box art for GUISCARD and DEX AÏE. The dark skies add a shakespearian twist to the scene in my modest opinion. The 15 Stun stances of the knights were a very lengthy task, but I'm quite pleased with the result. The stances of the 4 Welsh Uchelwyrs on foot are quite dynamic. March 17, 2015 A first sneak peak at the Norman Keep, the first map for the upcoming THE ANARCHY extension. Still a lot of work to do to get a perfect result, but it gives you a good idea of what you can expect. A big update to the site navigation, with an enhanced look for the extensions presentation page and page titles which finally use the official 'Souvenir" font (something which is at least 10 years overdue!). The Italian version of the site got expanded with all the Norman Saga pages and an update to the site navigation and page title format. Many thanks to Giorgio Colonna for the translations. The play sheets and rules in Italian for DIEX AIE are now on-line. Thanks again, Giorgio ! The play sheets and rules in German for DIEX AIE are now on line. Many thanks to Lutz Pietschker for the translation. 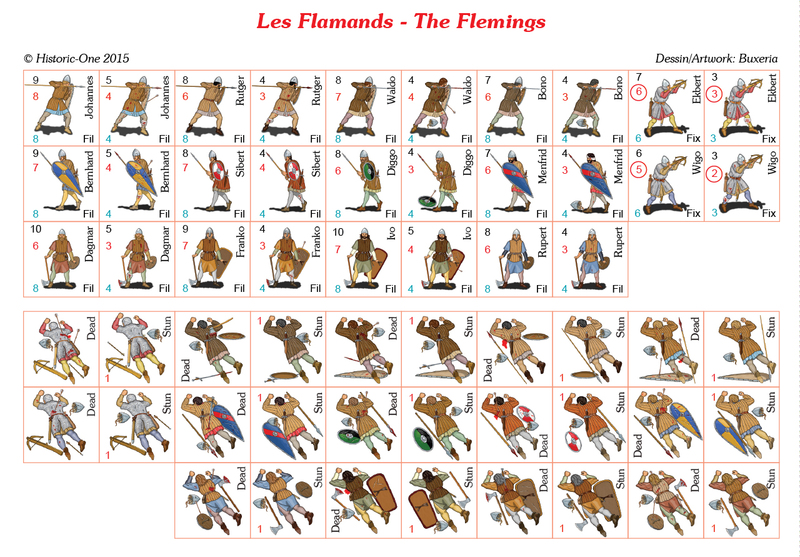 Mar 1, 2015 A fifth series of Anglo-Norman knights and a new class of characters: The Flemish infantrymen, who were widely used as mercenaries by both sides during the civil war. The Hill map is now out of print. A version 2 is being designed but will probably not be available until later this year. Erratum v3 for Diex Aïe: Simply a small mistake corrected in the caption of the example in section 5.5.5. The German page for Diex Aïe is now live! Many thanks to Lutz Pietschker for the translation. Translation of the playsheets is done (I still need to include them in the templates) and translation of the rules is almost complete. January 27, 2015 4 slingers and 12 peasants with scythes, pitchforks and flails were added to THE ANARCHY counter roster. Such characters were missing in the 2 previous games and I'm glad to finally add them. January 24, 2015 First siege engines for THE ANARCHY with a real-size Battering Ram and a Gallery. 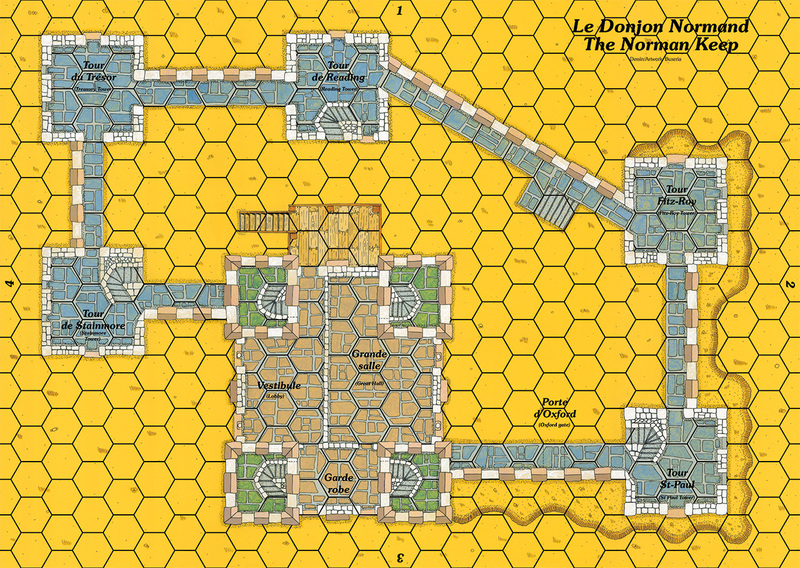 I used the cut-out effect to show both the freshly cut hides covering the roofs and the ground with the hexes. New Erratum for DIEX AÏE to improve the balance of Scenario 5, where it was too easy for the Saxons to block the Normans on the bridge and win the scenario. January 18, 2015 GUISCARD, which was out of stock is now available again. We took that opportunity to add the various counter sheets, maps and overlays to the Shoppe as separate items. The Markers sheet, which was out of stock as well, will be available again on January 23, with revised Stun and Dead faces for the camel rider, as the former ones were no longer up to the (high) quality standard we strive to provide. Many new counters for THE ANARCHY, including new knights, light infantry and Wesh javelin and long bows. Jan 3, 2015 THE ANARCHY will be the next extension, to be released by the end of 2015. It will focus on siege warfare and is set in the 12th century, at the time of the civil war for the succession of Henry Beauclerc. The presentation page is now live and you will be able to track the game design progress. A series of knights is already posted. I did a general overhaul of the website, updating the navigation and refreshing some contents to make sure the site remains in good condition. Dec 31, 2014 Second erratum for DIEX AIE, dealing with the Campaign rules (management of wounded characters) and modifications to the first 3 scenarios. Guiscard is out of stock, but a new print is expected in January, so just a bit of patience if you are in search of this game. December 21, 2014 First erratum for Diex Aïe: 2 Thegn counters are listed in the various scenarios which are not available on the counter sheet. 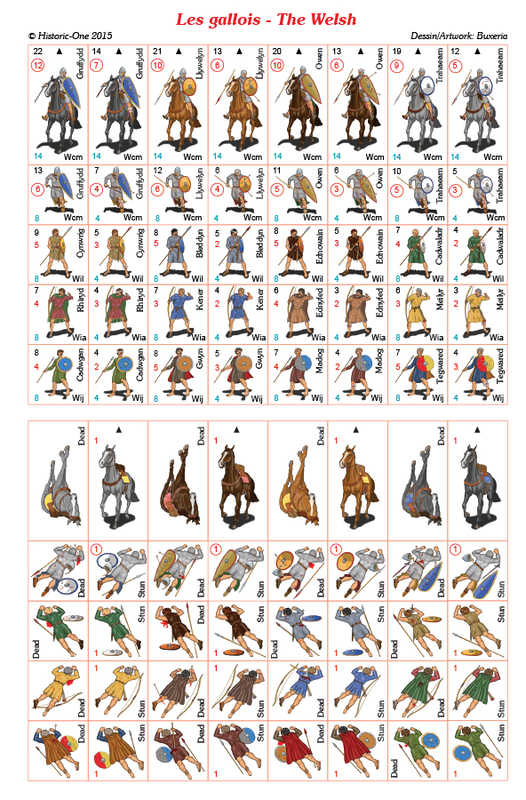 The erratum proposes substitutes which can be found in the box itself, the Saxons sheets from the Saxon Harbor extension or the Vikings/Viking Raiders boxed game. December 11, 2014 The double map Orléans is out of stock and won't be reprinted. If you were looking forward to get it in the near future, check with our various resellers : They are listed on top of the first page of the Shoppe. 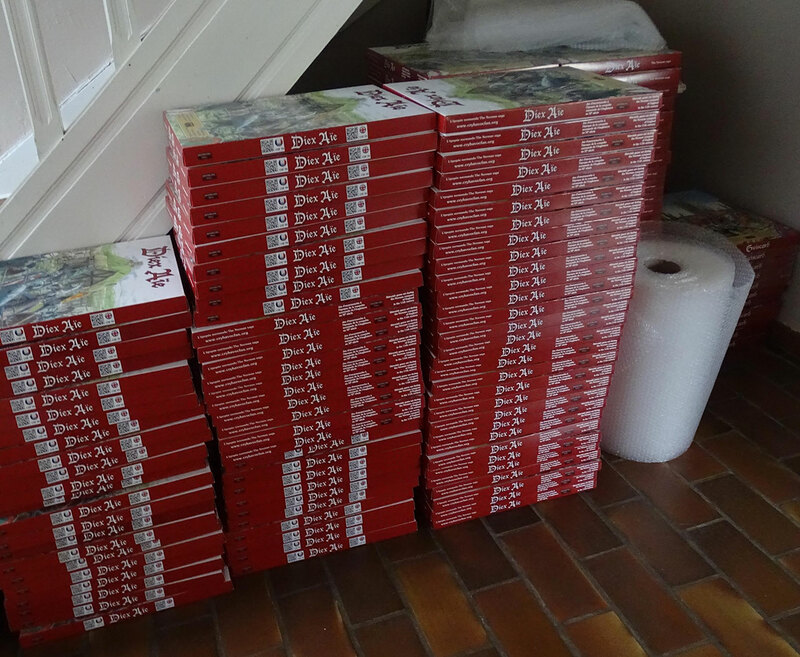 December 8, 2014 Today was THE day: We shipped the first orders of DIEX AÏE! We expect to clear the entire backlog by the end of the week. A notification eMail will be sent when your order shipped. Thanks again for your active support. December 5, 2014 We received the empty Diex Aïe boxes and have started the lengthy assembly process. The contents should be delivered today and we will start shipments on Tuesday, Dec 9. As a consequence, the pre-order period is extended until Monday, Dec 8. Nov 28, 2014 The second version of The Desert map is now available in the Shoppe: Graphics were enhanced (new terrain and slope aspects, bilingual texts with improved font, new regular hex grid). Nov 22, 2014 Pre-orders for DIEX AÏE are now open until December 5th, which is the expected release date. Special price of €59 (Recommended list price after Dec 5th will be €64. 5 additional maps will be needed to play 3 out of the 13 scenarios of DIEX AÏE: The River, The Knoll, The Crusader Trail, The Meadow and The Hill. Don't forget to order them with your DIEX AÏE order if you don't already have them at no additional shipping cost. Promotional prices for these 4 maps: The Desert and The Hill (€4 instead of €7), Orléans 1429 (€9 instead of €14) and the Crusader Harbour (€14 instead of €21). Nov 16, 2014 Incredible amount of work this last month to complete DIEX AIE! First off, the new Campaign game system was a much bigger endeavor than anticipated and the fine tuning took a lot of time, but I think you will like the result. You can look at the box art, the enhanced counters, maps and the brand new play sheets if you want a quick introduction to the game concepts. There will be 13 tactical scenarios and 4 campaign scenarios. Note that, just like with Guiscard, you will need additional maps to play the last 3 tactical scenarios, namely The Knoll, The Crusader Trail, The Meadow, The River, The Hill as well as the Lagoon map of Guiscard. Having the various Saxon and Viking counters available in the Shoppe will also help. All the game components should go to print in the coming days for an expected release date of early December (if everything goes according to plan, but we should always plan for some delay). September 28, 2014 All the Dead stances are completed and the back counter sheet is now over. I started the wounded stances: All the Scots are now completed as well as many Normans. I expect to finish all the counters within about 10 days. Finally! September 21, 2014 The Stun stances of the Saxons are completed, as well as the Dead stances of the Norman cavalry and Medium Infantry. Most of the heavy work is now completed. Generated all the missing Dead and Wounded stances should be completed in the next 3 weeks. August 17, 2014 The Stun stances of the Scots as well as the Norman horses are now posted. I started to write the campaign rules for DIEX AÏE and posted the initial counter artwork. I will post a short description of the various concepts soon to get your feedback. August 5, 2014 All the "In good health" stances for DIEX AÏE are completed, as well as the "Stun" stances of the Normans and I just started to create a few Norman horses. 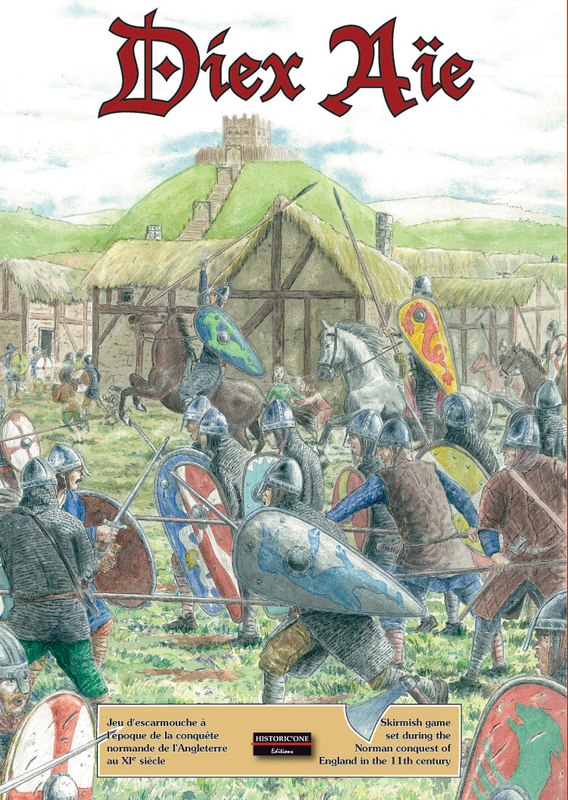 Jun 30, 2014 Major update to the DIEX AIE page with 2 new maps (The Woodbridge and The Ditch), one overlay (The Saxon Great Hall); examples of map layouts and multiple new counters, including a Norman noble, a mounted Saxon thane, the foot versions of the Scot and Norman light cavalry, Scot and Saxon light infantry, civilians and pack animals. June 25, 2014 8 new maps are now available for sale in the Shoppe. I created a dedicated presentation page so that you don't have to browse through several pages to discover all of them. Shipments will start on June 30th. All these maps (plus my real job) kept me away from DIEX AÏE for 2 months, but I'm now resuming with 4 Norman foot knights and 3 crossbows. April 6, 2014 6 Norman medium infantrymen in 3 different stances and 3 additional cavalrymen for DIEX AIE. The presentation of the web site was enhanced to better suit the current graphical trends: Good-bye 3D effects and shadows and welcome plain grey titles and semi-transparent texts over pictures. The navigation was refreshed as well: The rarely visited "On line gaming" pages are now part of the Resources section, the Magna Carta moved under the Extensions section and a specific sub-section named "The Norman Saga" was created to present GUISCARD and its future extensions. Finally, the Shoppe can now be directly accessed from the navigation bar. Not all pages were updated yet as this is a long process, but the major ones are already done. Apr 2, 2014 I added a Scot faction to DIEX AIE! 2 cavalrymen, javelinmen and slingers were already created. Don't look for characters wearing kilts (they only appear during the 16th century) and with blue-painted faces (these were the Picts at the time of the Romans). Braveheart was a great movie but historical accuracy was not part of the requirements! Note that they all wear a yellow shirt made of thick wool which could (almost) attenuate a sword impact, and which was dyed with horse urine. March 24, 2014 6 Norman medium infantrymen in 3 different stances and 3 additional cavalrymen for DIEX AIE. Mar 18, 2014 5 Norman knights in 3 different stances were added in the DIEX AIE page. The German translation of the GUISCARD rules were added. I had them since December 25, don't ask me why I didn't do it earlier! Le Valet d'Coeur in Montréal (Canada) is our new Guiscard reseller. The map of the Welsh Castle is out of print. It will go back to print later in 2014 in a new enhanced version (standardized hex grid, new rock artwork and removal of the pier which will be made available on a junction map for more flexibility). February 27, 2014 I added the presentation page for DIEX AIE, about the Norman Conquest of England, which will be completed as the game creation proceeds. A few Norman and Saxon characters are already displayed as well as the Motte & Bailey map. Note that contrary to what we printed on the back of the GUISCARD manual, the game won't be released until the end of 2014 as this is yet another massive endeavor and the selling activities for GUISCARD are still consuming a lot of time. Brief presentation page for MARE NORMANNORUM, the second extension for GUISCARD set in the first half of the 12th Century around the Mediterranean Sea. I only started to collect the illustrations to draw the characters, but the artwork will only start after the release of DIEX AIE, hence a release expected in 2015. We keep on adding new resellers in various countries like Camelot Games in Italy or Mas Que Oca in Spain. 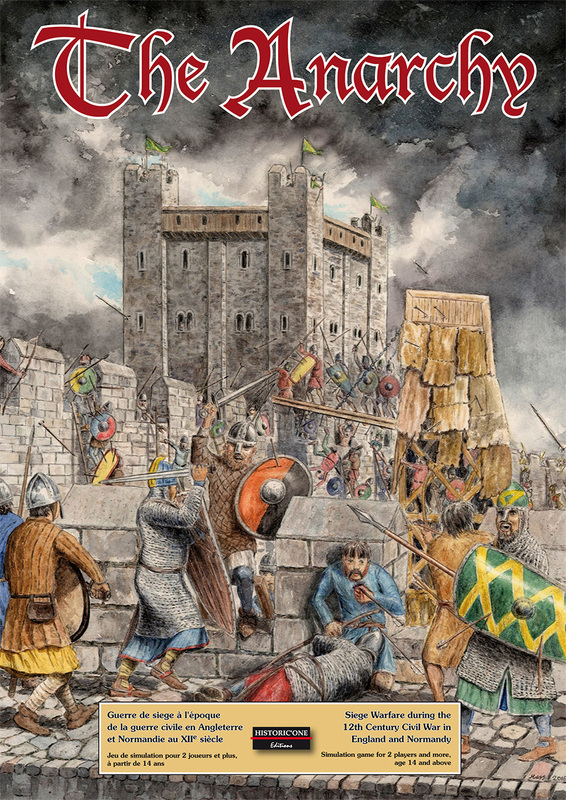 GUISCARD got a very positive 2-page review in the latest issue of Vae Victis, the French wargame magazine. You can preview the article by clicking on the magnifying glass next to the Guiscard entry in the table of contents.